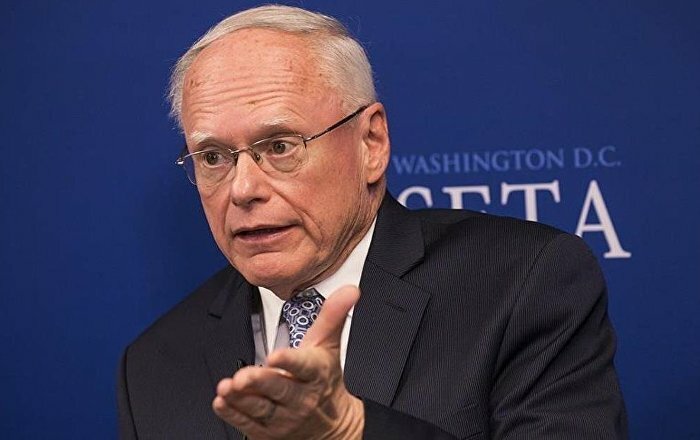 The U.S. ambassador James Jeffrey, Washington’s Syria envoy, said people who were displaced from Kobane should return to their homes, Sputnik reported on Friday. Jeffrey met with the representatives of the Kurdish National Council (KNC), a coalition of Syrian Kurdish parties not aligned with the Democratic Union Party (PYD), and Jeffrey said 200,000 people should return to their hometown, Syria's Kobane, lying immediately south of the border with Turkey, according to Sputnik. "Jeffrey said 200,000 people of Kobane should return to their homes. To bring these people back to Kobane, we have to put an end the oppressive policies of the PYD and set a political solution," Sputnik quoted Eli Temmo, a representative from KNC who joined the meeting with the U.S. envoy. Last year, PYD arrested Temmo and politicians from other parties in the region and that's why people fear from PYD, according to Temmo. "We have reported that the PYD arrested people in Kobane, Qamishli and elsewhere. If there were political solutions, people would return to their hometown without fear. The people of Kobane are looking forward to returning. If we -as the politicians- go back to Kobane, people will return, too. We want our people to return, but the conditions of return should be created," Temmo said. Temmo also said the council understood that Ankara and Washington had agreed on the east of the Euphrates. "As we understood, Turkey does not accept any presence of PKK in the east of the Euphrates river, but does not object the existence of the Kurds in the region. PYD hanged pictures of Abdullah Öcalan (the jailed leader of PKK) while they capture several Arab settlements. These behaviours are not acceptable," the Russian newspaper quoted Temmo as saying. The People's Protection Units (YPG) controls the border city of Kobane and the majority of northern Syria. Ankara views YPG as an extension of its indigenous Kurdish armed group, Kurdistan Workers' Party (PKK) and labels both groups as terrorist organisations. "Kobane is very important. If there would be a political solution and if people would be able to return to Kobane, it will spread to the other regions and people can return to their homes in other cities, too," Temmo said. ABD'nin Suriye Özel Temsilcisi James Jeffrey, DSG'nin elindeki Fırat’ın Doğu bölgesi için Suriye Kürt Ulusal Konseyi (ENKS) ile özel bir görüşme gerçekleştirdi. Sputnik'e konuşan ENKS yöneticisi Eli Temmo, Jeffrey ile Fırat’ın doğusunu konuştuklarını belirterek, ABD'nin Kobani dışında yaşayan 200 bin Kobanilinin kente dönmesini istediğini söyledi.